The large German engineering company Krupp had been involved in designing and manufacturing ammunition, artillery, armored fighting vehicles and weapons for the German Army for many years. 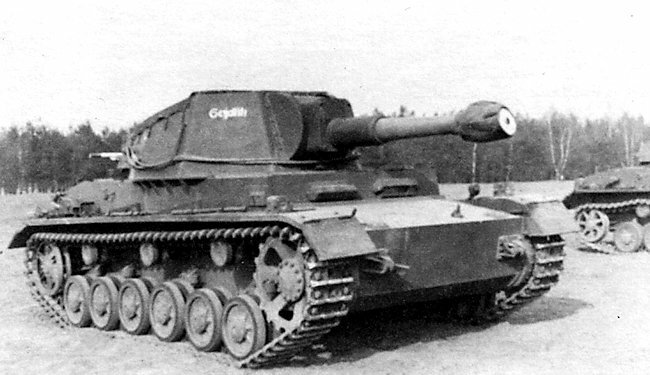 They had received their first order to build 135 Panzer I tanks in 1933. In 1939, they turned their attention to the problem of how to mount a large artillery gun on a tank chassis. Their solution was to fix a 10.5cm LeFH 18/1 artillery light field howitzer on top of a shortened Panzer IV tank chassis in an open-topped turret. It was given the official designation 10.5cm leFH 18/1 (Sf) auf Geschutzwagen IVb. The chassis had only had six road wheels rather than the normal eight. The six wheels were 570mm diameter instead of the normal 470mm diameter road wheels. It also only had three not four top track rollers. Krupp presented their design to the military on 14th September 1939. Completed 10.5cm leFH 18/1 (Sf) auf Geschützwagen IVb at the factory. 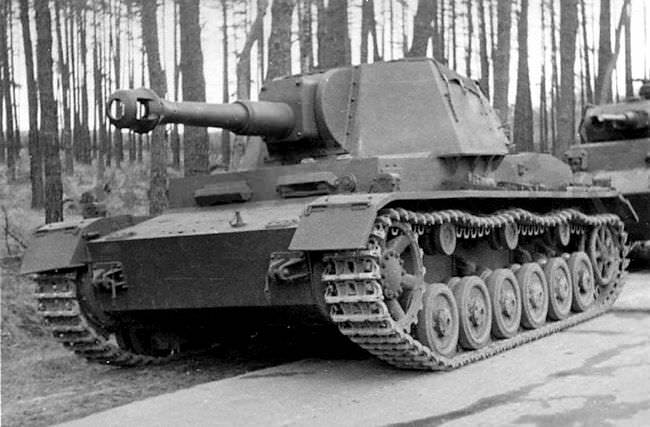 It was based on a shortened Panzer IV tank chassis with only six wheels and not the regular 8. The turret could not fully traverse 360 degrees. It could only traverse 70 degrees: 35 degrees to the left and 35 degrees to the right. It was not a tank, even though it may resemble one at first glance. Two test vehicles were built. They were given the internal factory designations of V1 and V2 (nothing to do with the later flying bomb and rocket). The letter ‘V’ was an abbreviation for the German word ‘Versuchs’ which translated means trail or prototype. The German Army liked what they saw and put an order in for 10 more to be built in the autumn of 1941. The first one was completed at the Krupp-Grusonwerk factory in August 1941, three more in September, four in October, one in November and one in December 1941. The 10 vehicles were accepted into the army in January 1942. The first two test vehicles V1 and V2 were powered by a Maybach HL66P engine that produced 188 hp. The next ten SPGs were given a more powerful engine, a Maybach HL90 P20k 12-cylinder engine that produced 320 hp. Their chassis numbers ranged from 150631 to 150640. They were given the official designation of 10.5cm leFH 18/1 (Sf) auf Geschützwagen IVb (Sd.Kfz.165/1). This was shortened to 10.5cm leFH 18/1 (Sf) auf GW IVb or Pz.Sfl.IVb. The turret armor was not thick. It ranged from 14.5 to 30 mm (0.57-1.18 in). It provided the gun crew protection from small arms fire, high explosive shell fragments and mortars. The open top reduced weight and allowed the commander all round vision. In bad weather, a tarpaulin was fixed over the top of the open turret. It was also used in very hot weather. When not in use, it was rolled up on top of the rear turret storage box. The Panzer IV hull mounted machine gun was removed to free up more storage space. This vehicle was not designed to be an assault gun or anti-tank gun. It was to provide mobile artillery support that could keep up with the attacking Panzer Divisions. It was not envisaged to be fighting on the front line. It could fire high explosive shells over long distances onto enemy targets it was given via a grid reference by forward observation units. If Soviet infantry got too close they could use their personal weapons or retreat as fast as they could to a safer location. The gun was issued with a few armor piercing AP rounds for self-defense if they were surprised by Soviet tanks. They only worked at close range and were ineffective against the front armor of the more heavily armored T-34 and KV-1 tanks. The commander sat at the rear of the turret on the left side behind the gunner. He had access to a range finding periscope mounted to the side of the vehicle. The gunner’s gun sight poked out above the top of the forward gun shield and armor casement. The loader sat on the right side of the vehicle. Spare road wheels were often fixed to the rear engine deck. 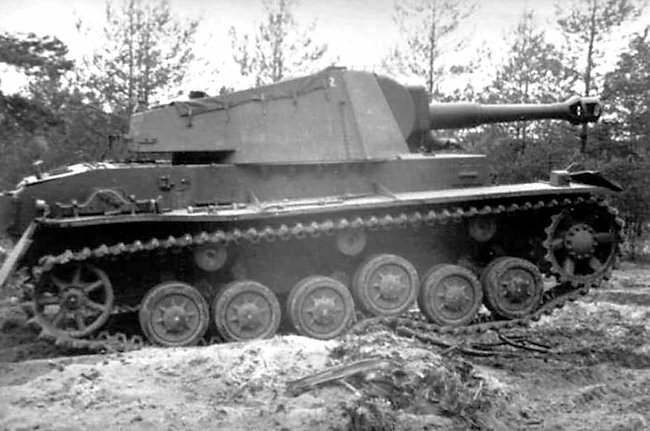 The vehicle was fitted with six enlarged 520 diameter road wheels on both sides to cope with the extra weight, not the normal Panzer IV tank’s eight pairs of 470 mm diameter road wheels per side. In the case of damage to the wheels, they could be changed by the crew. A square jacking block was affixed to the right side of the hull just under the rear of the turret. The jack was kept on the rear track guard at the back near to it. 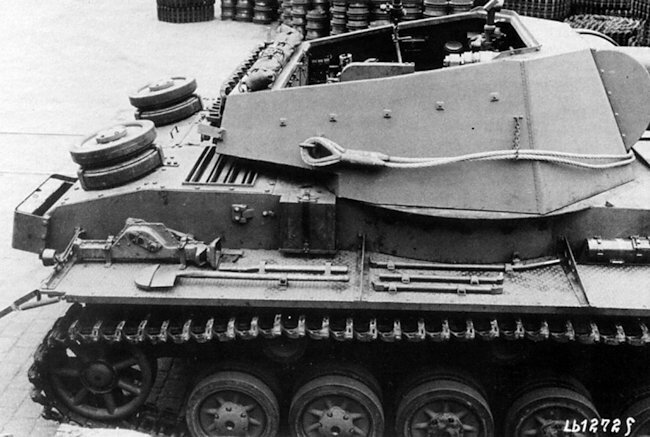 Metal tow cables were stored around the outer turret armour plates. Spare track links were fixed to the rear storage box at the back of the turret. 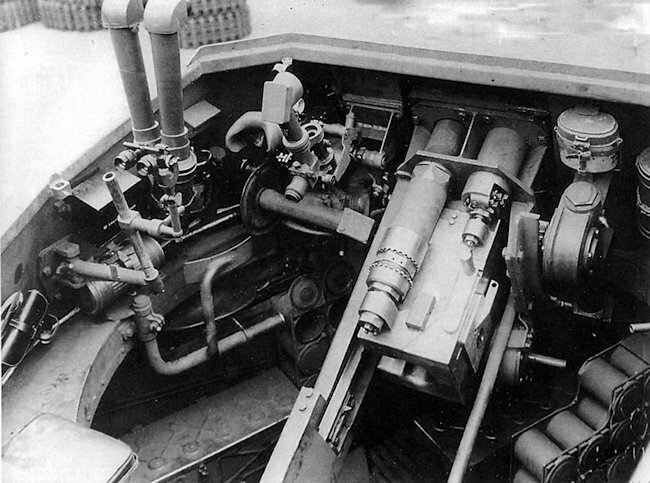 A mock driver’s armoured vison slit replaced the hull machine gun on the right side of the front upper hull in an effort to confuse enemy gunners. The driver sat on the left of the SPG. 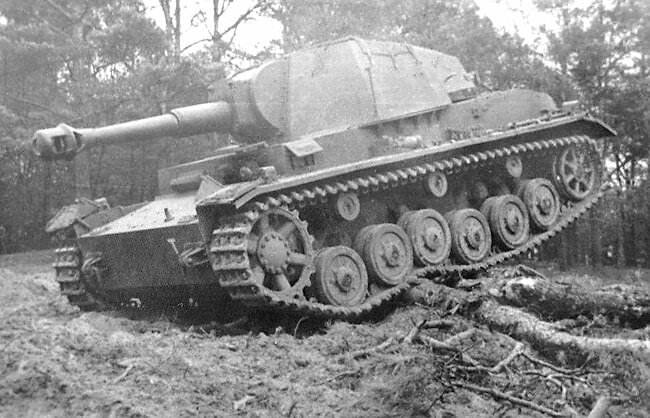 During 1942, the ten prototypes underwent trials on the German Army’s eastern test range with the Feld-Versuchs Batterie (field test battery), 16th Panzer Artillery Regiment, 12th Panzer Division. These were successful. An order for a further 200 10.5cm leFH 18/1 (Sf) auf GW IVb SPGs was placed. They were going to be built at the Stahlindustrie in Muelheim-Rhur. The problem was building enough Panzer IV tank chassis to be converted into artillery self-propelled guns. More Panzer IV tanks were urgently required to deal with the Soviet Army’s new T-34 and KV-1 tanks. 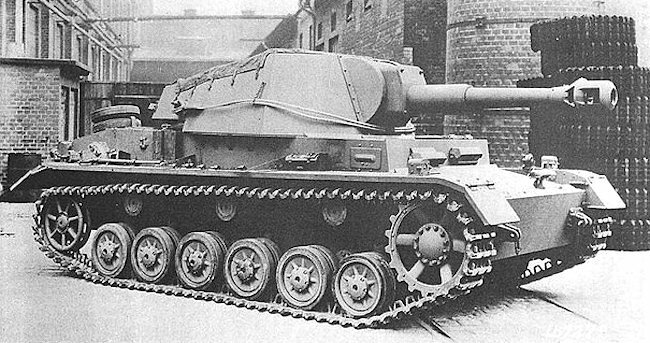 In the meantime, the engineers realized that they could mount the same 10.5cm artillery gun on the now obsolete Panzer II tank chassis. 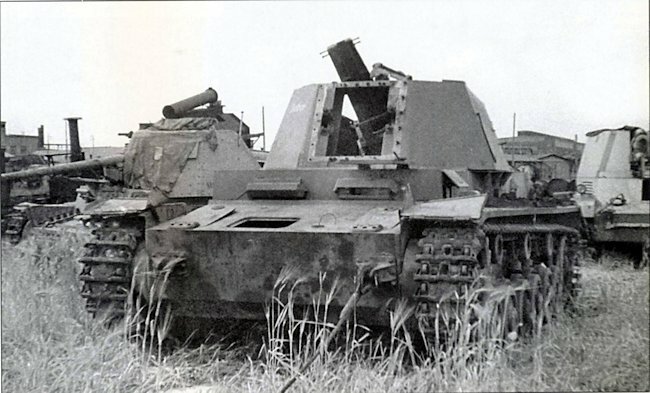 This new SPG was later known as the Wespe. No more 10.5cm leFH 18/1 (Sf) auf GW IVb self-propelled artillery guns were built. The order for the additional 200 was canceled in November 1942. 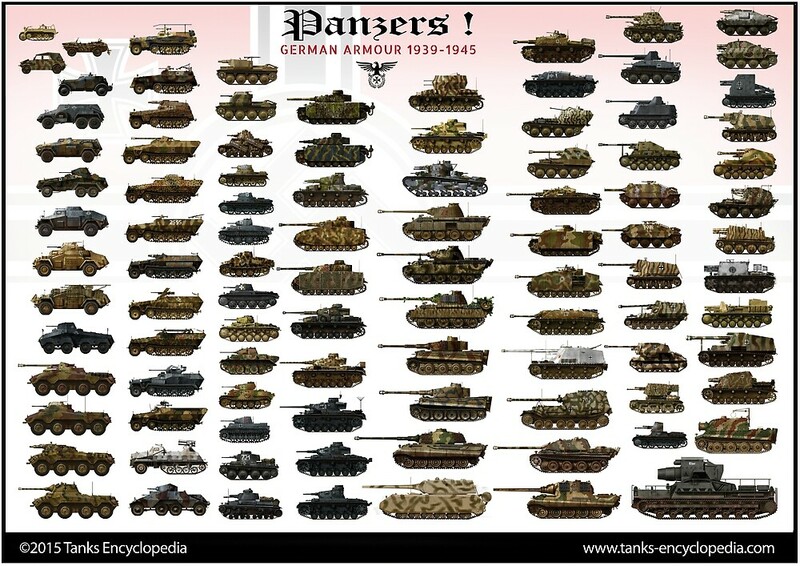 All ten vehicles served with the Panzer-Artillerie-Regiment 16, attached to the 16.Panzer-Division on the Eastern Front. The Division was held in reserve during the Balkan Campaign, but took part in the invasion of the Soviet Union, Operation Barbarossa, in June 1941. It was used in the southern sector of the Front, advancing to Stalingrad via Lvov, Pervomaisk, Zaporozhe, Taganrog, Makeevka and Artemorsk. 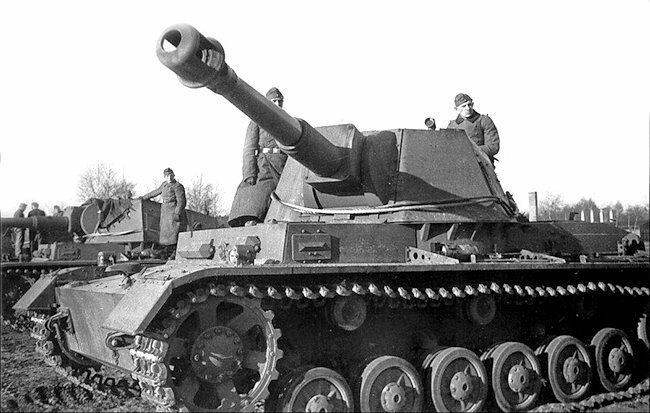 The 10.5cm leFH 18/1 (Sf) auf Geschutzwagen IVb joined the rest of 16.Panzer-Division in late December early January. The regiment was destroyed in early 1943 in the Stalingrad pocket. 10.5cm leFH 18/1 (Sf) auf Geschützwagen IVb self-propelled artillery gun in gray livery. The gun crew have their thick long winter overcoasts on. Notice the false armored driver’s vision slit where the hull machine gun would have been. The 10.5cm leFH 18/1 (Sf) auf GW IVb turret had a gunner’s periscope sight at the front on the right side. Behind that was a range finder fixed to the side for use by the commander. 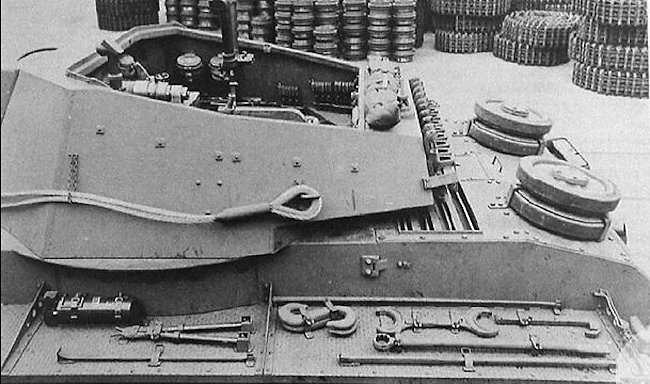 Tools were fastened onto the upper track guards and spare track links were fixed to the rear of the turret. Newly completed 10.5cm leFH 18/1 (Sf) auf GW IVb SPG at the factory. Notice that the tow cable is stowed around the turret and spare road wheels are on top of the engine compartment at the rear. 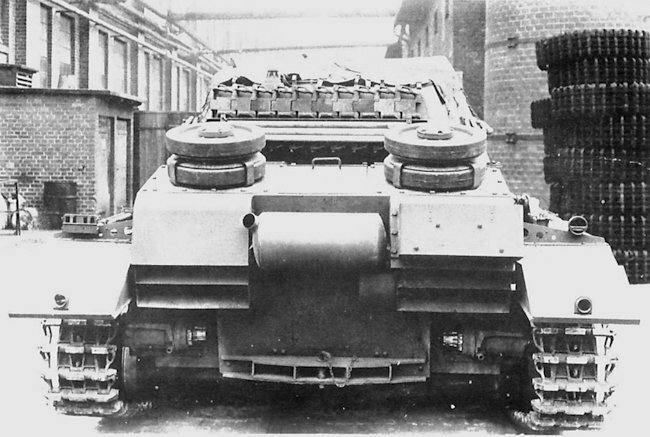 View of the rear of a 10.5cm leFH 18/1 (Sf) auf Geschützwagen IVb showing the tow bar, exhaust system and spare road wheels and track links. Tools like the jack, jack plate, axe and spade were strapped down to the right hand side rear track guard. A US ordnance team inspecting the Rheinmetall proving ground at Hillersleben found this gun less 10.5cm leFH 18/1 (Sf) auf Geschutzwagen IVb artillery SPG. When will we see the art work again? When our illustrator comes back from his break. How long is his break? I appreciate both the art, and the articles. Does anyone know what the name is on the side of the turret? Schill: A German romanticized war hero from 1800. Is it really shortened Pz IV chassis? Indeed the roadwheels are 6 on each sides but they’re larger than IV’s wheels. Actually they were not code names, nor confusing. They were simply internal factory designations for “prototype 1” and “prototype 2” (“V” coming from German word Versuchs). Similar system was used by all vehicle manufacturers in Germany, in aircraft industry “V” stood for Versuchsflugzeug, among tank manufacturers it was probably Versuchspanzer or versuchskampfwagen. Note that these were internal and unofficial designations for systems/variants which private firms were developing for the state; government agencies had official designations for all weapon systems which were accepted into service (see for example RLM designations for aircraft types). These prototype numbers could go very high indeed as vehicles were developed further: for example, Ju-88 V44 was the first Ju-188. With V-1 and V-2 (and rarely mentioned V-3 gun) “V” had another meaning: Vergeltungswaffe, or revenge/retribution weapon. These were also unofficial designations, originating from Propaganda Ministry. For example, in all official design/test/procurement documents the V-2 was referred as A-4 (Aggregat-4). Note that the prototype “v”-numbers don’t have hyphen between letter and number(s), unlike revenge-weapons. Thank you for taking the time to send us such an informative comment. I have made the changes to the article. V3) or with hyphens (V-1,V-2 and V-3). About this V-weapons terminology, well..
both versions simultaneously…).Apparently even the Germans themselves used both version during 1944-45. The article mentions that the vehicles were constructed from August to December of 1942. That is immediately followed up with “The 10 vehicles were accepted into the army in January 1942.” From reading the rest of the article, I think the first year was meant to be 1941.